This post is sponsored by Nebraska Furniture Mart, one of my favorite stores! All opinions are my own, thanks for supporting the brands that support this blog! It’s grilling season friends and I’m all about walking out on my deck to cook dinner instead of heating up the house with my range or oven! We have been trying to get a lot more vegetables into our diet and grilling is just another way to add great flavor to veggies. Also, chances are that if you have a bbq you might have a friend who is a vegetarian and will love you for having this option. Eggplant is a sponge so whatever flavors you put on it just soak right in. 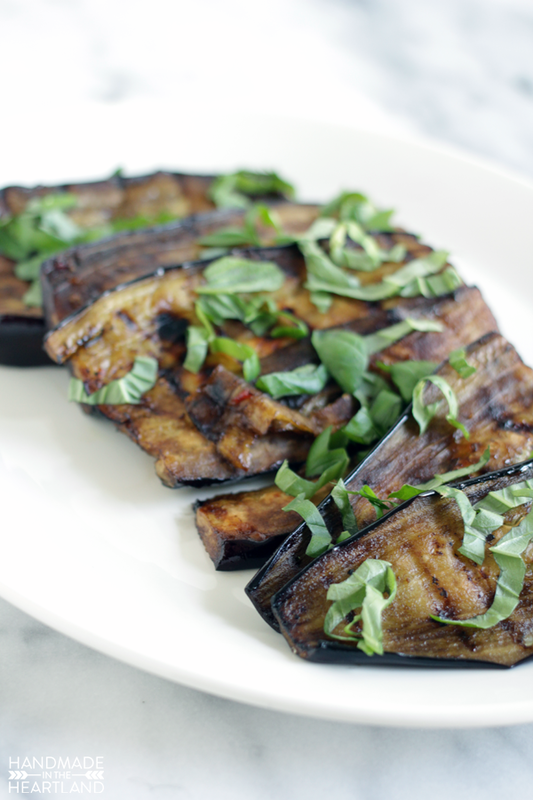 The trick to this eggplant is marinating it in a delicious balsamic thai sauce and then topping it with fresh basil from the garden. 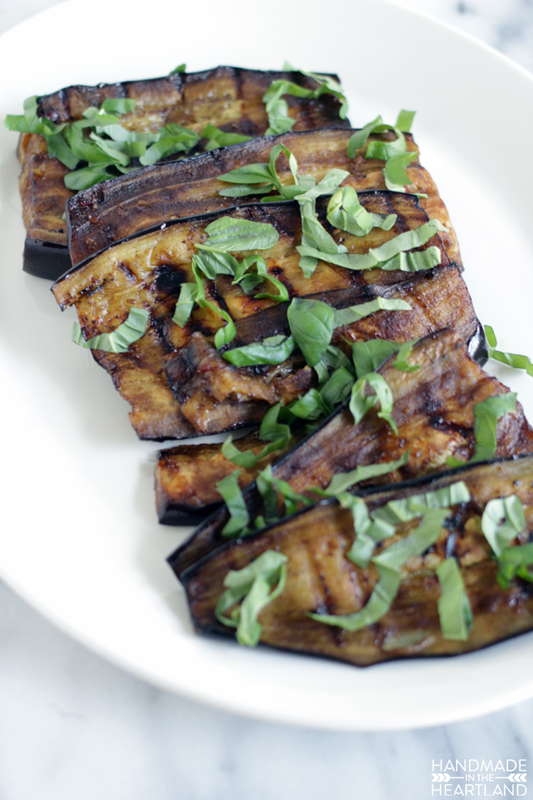 This recipe for grilled thai basil eggplant can be a main dish for veggie lovers or a healthy side to go with your tailgating favorites. 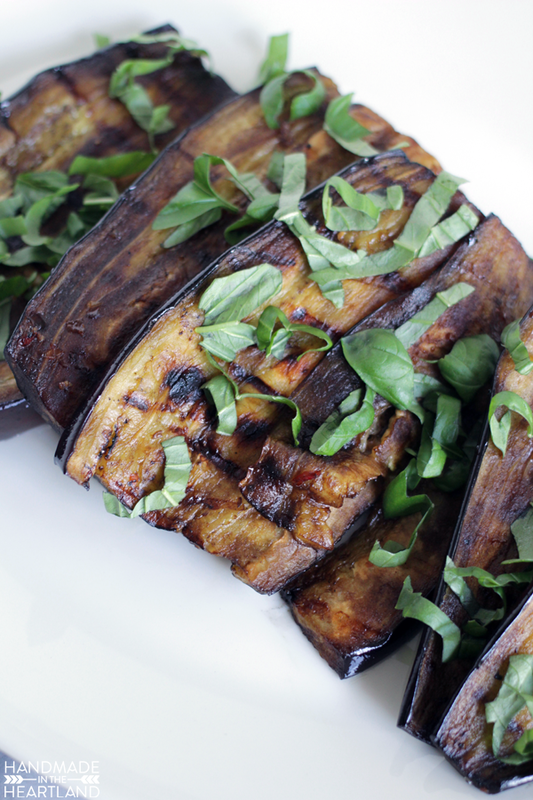 Have you ever cooked with eggplant? About 4 years ago I tried it for the first time, and actually on the grill in a ratatouille of summer vegetables. It’s a great vegetable to add in to your diet, it has a really mild taste and can like I mentioned absorbs the flavors you cook it with. It’s a great source of vitamins and nutrients- just google it and you’ll see! 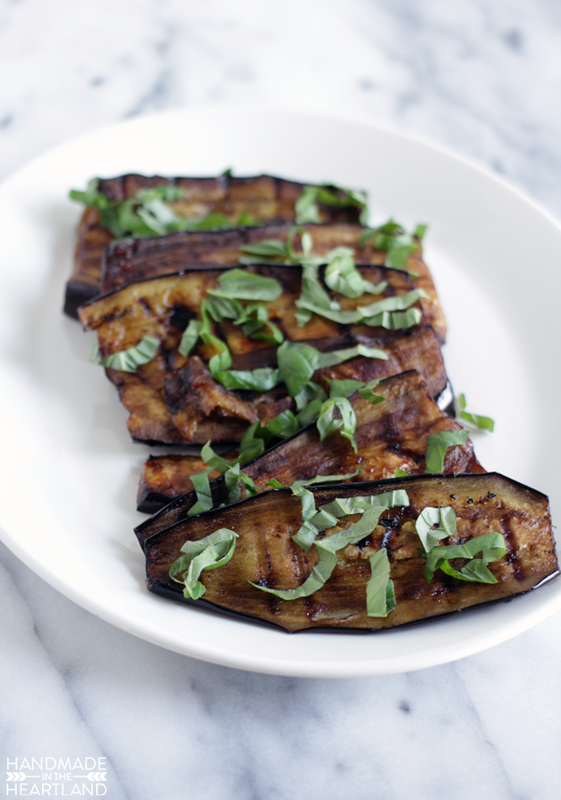 When you go to grill this recipe make sure you take the eggplant slices out of the marinade and pat them dry on a paper towel. I did not do this step and almost caught the entire grill on fire from the excess oil. So don’t do that! If you get the excess oil off they will be just fine. For this grilling recipe I’m partnering with Nebraska Furniture Mart on an amazing giveaway- the winner will receive the following items valued at over $1000! Its a pretty darn awesome giveaway to up your tailgating game! click over HERE to enter! 1. A Weber Q1200 Grill! You know they are the best in grilling and this portable grill looks ahhhmazing! 2. A Dish Network KING Tailgater 2 – So you don’t have tickets, who cares?! You’ll have the game right in the parking lot with this guy. 3. You’ll need something to watch it on, right? This 43″ LED TV will work! 4. And you’re gonna need something to cook on that Weber so NFM is hooking you up with a $75 Omaha Steaks gift card! A great side dish or vegetarian option for grilling! 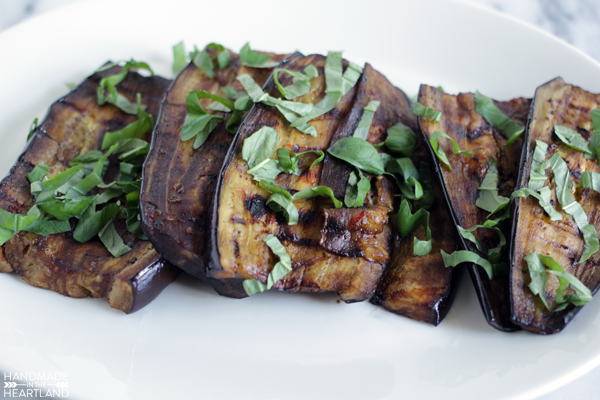 Eggplant is the perfect thing to marinade because it’s spongelike texture soaks up all the flavor. This recipe is a delicious side or vegetarian main dish for a bbq. 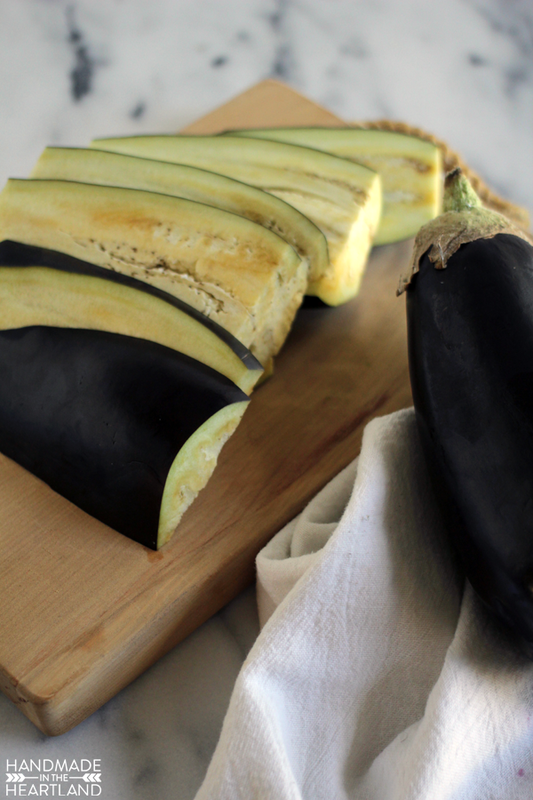 Slice your eggplant lengthwise into long “steaks” and set aside. In a medium bowl combine olive oil, garlic, salt, vinegar & chili sauce together and then pour into a gallon size ziplock bag. Place the eggplant slices in the bag as well. 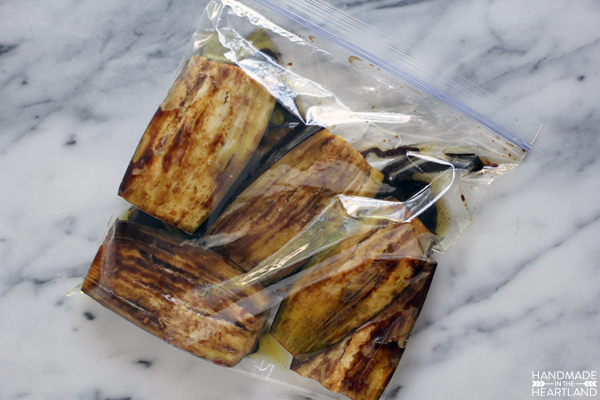 Let the eggplant marinate for at least 30 minutes before grilling. 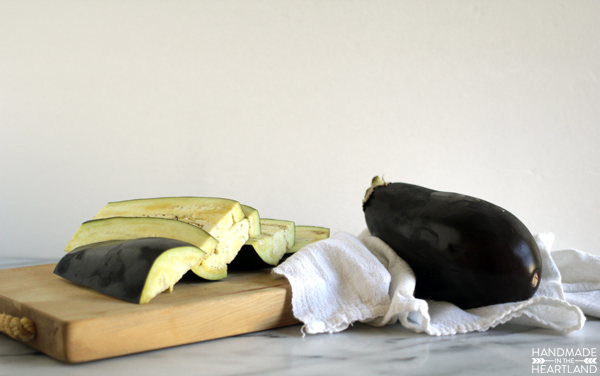 Take your eggplant slices out of the bag and lay them on a paper towel to soak up excess oil and pat them dry. If you skip this step of patting dry you run the risk of starting a fire on your grill! Heat your grill to medium-high heat. Grill the eggplant slices for about 3-4 minutes on each side, you should have some good grill marks on each side. 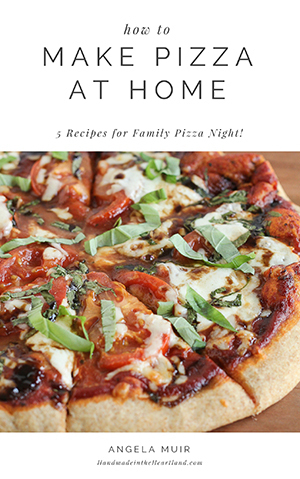 Serve with sliced basil sprinkled on top. What are your favorite grilling recipes? Do you grill veggies? I’d love to hear about recipes that you love, share it with me in the comments and if you make this recipe tag me on Instagram (@handmadeintheheartland) or Facebook! It thrills me to see you creating things from the blog! Need to save it for later? Pin the image below!